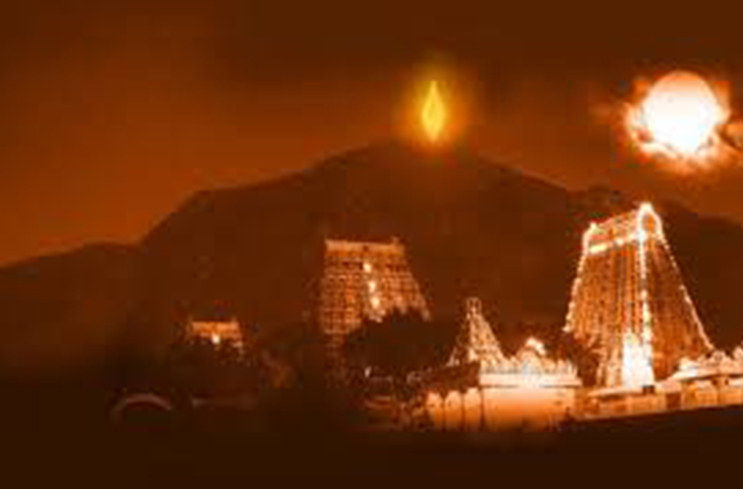 The SACRED ARUNACHALA DEEPAM (Flame) seen on the summit of Arunachala Mountain and which is lit on the mountain every year. Walking to the top of Arunachala at a height of 600±20 meters (2034ft) from Ramana ashram, took author a grueling 3-4 hours in 2015 (her second climb), as it is quite a challenge and very few have been known to attempt it except the locals. At the summit there is a small cave where a highly evolved Siddhar saint Sri Ayya Narayana Guru Suwamigal lived for many years who had given up food and lived only on white tea and water for more than nine years. In 1999 on her first climb, Author had had the blessings to meet this Siddhar (realized sage) and received many blessings from him. It is a living tradition that Arunachala has sheltered saints and spiritual practitioners down the ages. Over the centuries, many saints and sages have been drawn to Arunachala and settled on Arunachala. Saint Namasivaya lived in one of Arunachala's caves which is still known by his name. Virupaksha Deva lived in an OM-shaped cave higher up on the Hill, and this cave too still bears his name. Located on the south-east slope of Arunachala, this was the cave that Sri Ramana Maharishi lived in from 1899 to 1916. This vibrant spiritual center was made well known throughout the world by Sri Ramana Maharshi (1897-1950) who was widely regarded as one of the greatest sages of modern India. According to legend, associated with the Mountain, a dispute occurred between Brahma the creator, and Vishnu the preserver, over which one of them was superior? In order to settle the argument, Lord Shiva is said to have manifested as a column of light, which then took the form of Arunachala Mountain. In the Maheswara Khanda of Skanda Purana, sage Veda Vyasa describes in great detail the wonder of Arunachala. This Mountain of Light has been revered since ancient times as Shiva, God himself manifesting in the form of a sacred hill. (1) Mount Arunachala has the power to remove your ego and bring you closer to the Divine. That this can be accomplished even by just gazing at this sacred mountain. (2) Walking around Mount Arunachala will remove the negative karma from millions of births. Once you are free from the shackles of these karmas, your own personal evolution & liberation will be accelerated. (3) Many, many Siddha masters live at Mount Arunachala in their Light Body form. When you walk around Mount Arunachala, you can commune with these ascended masters and receive their grace and blessings. Occasionally, you may have the good fortune to encounter such masters who appear to you in a physical form disguised as beggars or wandering monks seeking alms or food. "Arunachala is truly the holy place. Of all holy places it is the most sacred! Know that it is the heart of the world. It is truly Siva himself! It is his heart-abode, a secret tirtha and kshetra (pilgrimage field). In that place the Lord ever abides… the hill of light named Arunachala." Asked about the special sanctity of Arunachala, Ramana Maharishi, said it is this place that bestows jnana (Self-knowledge) and because most people have so many other desires and do not truly want jnana, Arunachala has always remained comparatively little known. But to those few who seek jnana, Arunachala always makes itself known through some means or other.